For me it’s like the one stop shop … go to OneNote, open up their page, have they done it? Yes? No? Give them feedback. Sync it. Sorted! I sat down today and chatted with our English Head of Department, Ms Helaina Coote, about how using a Surface Pro 3 and Microsoft OneNote was impacting on her teaching and assessment practices for A.S. 91106 Form developed personal responses to independently read texts, supported by evidence. Was the goal to move to a paperless classroom and how has the workflow of your marking changed using a Surface Pro 3 and OneNote? Do you use colour coding for feedback? How is using a “digital pen” with your Pro 3 impacting on your workflow? Could you use OneNote for peer assessment and / or collaboration? 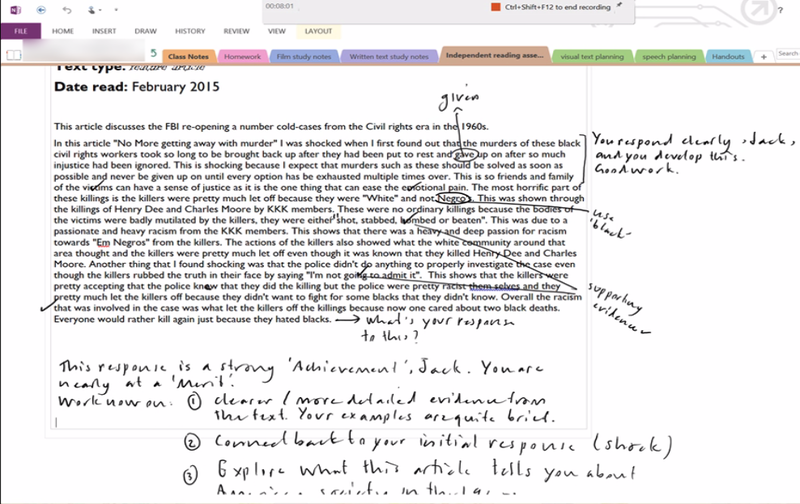 Do you provide oral feedback to students in OneNote? As a teacher, have these technologies made life easier and workflows more efficient? Whilst this has not changed the way I teach AS91106, it has completely transformed how I manage the assessment practices, allowing me to streamline the feedback I am giving to students. With students in her senior English classes required to read, listen, watch and respond to up to six different texts across three different terms at school, historically this created a lot of paperwork to manage. In this sense the technology has impacted “massively” on the speed of getting work marked and back to students. Previously, work was typically received via email, using Microsoft Word to insert comments or track changes, saving a copy locally, printing a copy for NZQA records and then emailing the revised copy back to the students with feedback. The Surface Pro 3 and the digital pen allows you to blend the “old school” with the “new.” I am still a teacher marking student submissions, but now I am using a digital pen and writing on an electronic submission. Furthermore, the feedback is literally real time – I do not even need to email it back to them. Student feedback has been overwhelmingly positive in terms of them receiving “written” feedback [via OneNote] … I’m able to do it much faster as well, so the pieces of paper don’t lie around on my desk for ages … it’s pretty immediate, as it’s a much more streamlined process. [Since the introduction of Class NoteBooks in OneNote] I have found it incredibly useful … I no longer have to lug around books or hand outs as it is all available on OneNote and all stored in one handy place. All my work and handouts are readily available whether I’m at home or at school its all there and backed up for when i need it. My teacher can now give me feedback on my work on OneNote using her Surface Pro 3 and and she can even hand write on it … I can see it instantly and then make new adaptions to my work hassle free as the interface on OneNote is so easy to use. It’s often tempting to focus on the way technology is impacting on the lives of our students and therefore I find it refreshing to hear teachers enthusiastically talking about how some of the routine aspects of teaching, such as marking, are being made easier through technology. It is intriguing that in this example it really was the naturalness of “writing” the feedback (albeit digitally on a tablet), that appealed to both the teacher and students. I read an ICT report recently that suggested that by 2018 50% of portable “laptops” sold will be hybrids that have the ability to touch / write on them like the Surface Pro 3 that Ms Coote is using. It is a timely reminder that many of the established practices of teaching often need only minor tweaks to achieve optimum efficiency, rather than massively overhauling them with major technological changes. This entry was posted in eLearning, English, Technology and tagged AS 91106, Collaboration, Digital Pen, Education, English, Helaina Coote, Independent Reading, Information and communication technologies in education, Inking, Microsoft OneNote, Microsoft Word, MSFTedu, NCEA, NZQA, Office Mix, Office365, OneNote Class Notebook Creator, Secondary School, St Andrew's College, Student Voice, Student Work, Surface Pro 3, Workflows, YouTube by Sam McNeill. Bookmark the permalink.